There are few things that can define an era. Then there are fewer things not only that define an era but also seep into those succeeding it, and retain valuable cultural currency. A concept released in 1962 caused a stir and remains relevant to this day. It was the Ball Chair. A hollow sphere sliced on one side, giving the feeling to whoever is inside that they are, as the name suggests, sitting in a bubble. The design quickly gained momentum for its unusual style and it became a staple for many homes. The 60s embraced it, and it became a design phenomenon. The designer behind it all was Eero Aarnio. After studying architecture in Helsinki, Finland, Aarnio worked as a product designer for the largest furniture factory in Finland: Asko. He also worked for famed Finnish designers Ilmari Tapiovaara, who designed furniture for the Finnish army, and Antti Nurmesniemi known for his horse-shoe stool and his coffee pots. The two designers influenced Aarnio and taught him how to remain focused in design. “While working at Tapiovaara’s office I was drawing the final drafts of many designs for competitions with the final deadline at midnight and we would drive all the way to the Helsinki airport where you could get the latest postmark for the day. This is how I learned a disciplined way of working,” Aarnio recalls. But in 1962 he then decided to begin a more flexible freelance career that of course meant that he had to create his work without any financial support or capital. All he had was the knowledge that he gained during his years working collaboratively, “Tapiovaara rounded the corners of wooden products and Nurmesniemi made them sharp. When I started my freelance career I noticed that I had adopted both methods, I was obviously on my own then,” he said. 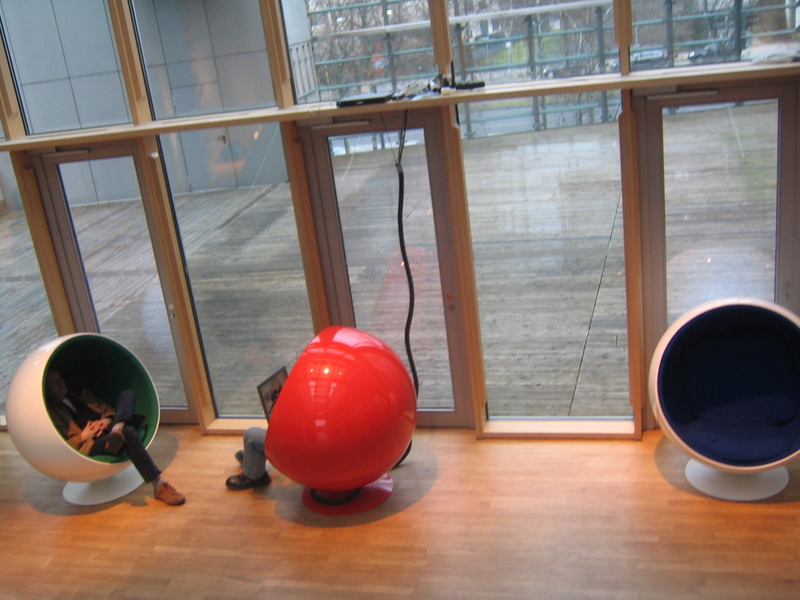 “I had to succeed and it was necessary and helpful to have a completely different kind of approach to furniture design and my first design the Ball Chair was a good example of this type of thinking, it stood apart from the rest of the furniture of that time,” says Eero Aarnio. The 1960s were his catalyst and the Ball Chair his lynchpin for his later designs such as the Bubble chair, which was similar to the Ball chair in shape and material (fibreglass), but was transparent and suspended from the ceiling. In 1966 he also designed the Cognac Chair, a halved version of the Bubble Chair. He is also renowned for the quirky Tomato Chair (1966), Pastil Chair (1968) and more recently, a Puppy Chair (2005). “I think that the chair plays a major role in furniture design and it is the most difficult and challenging piece of furniture to design,” he says. But it was the culture and the dominating distinct aesthetic of the 1960s that helped him develop his own Aarnio design aesthetic. Aarnio would also like to experiment with a range of other materials in the future, Finnish wood being a top contender. “The first prototypes (Polar Tree and a decorative platter Galaxy) have already been made with the use of a computer and milling machine,” he says. But plastic does remain as his go-to material. “It’s flexible,” says Aarnio of plastic. Reinforced plastic is not only fantastic but its flexibility allows the designer to experiment more with shape and form. Although Aarnio has proven to the world that he is capable of diverse design, it is Aarnio’s Bubble Chair and the 1960s that he feels embodies his work the most. “The most interesting piece for me is the Bubble Chair which is made like a soap bubble, air is blown to a heated acrylic sheet, therefore there is no need for a mould and the form always comes out the same, following the laws of nature (like a soap bubble),” he explains. “When functionality, form, material and aesthetics all are combined in the best possible way in a functional object, you will get a product which is hard to improve and it will last a long time unchanged. You could think of the designs of a wheel, a match, candle, safety pin etc,” he answers as to why his he believes his designs have stood the test of time. It is with little surprise then that Design Museum in Helsinki is hosting a retrospective of his work in April. It will be the most extensive overview of his work so far with works including lamps, furniture, small objects and unique one-off pieces dating as early as 1950. Viewers will also have the opportunity to see Aarnio’s original drawings and sketches. The Eero Aarnio Retrospective will be exhibited from Friday 8 April until Sunday 25 September 2016 at Design Museum, Helsinki, Finland.